This is a Mesa 2 Rugged Tablet quick start guide – so let’s get started. My name is O’Ryan Smith. I’m the product support manager at Juniper Systems, and I’ll show you a few simple steps to get you up and running on your Mesa 2. Here’s one basic question you might ask yourself before you turn on the Mesa 2: Do I need a Microsoft account? Microsoft recommends creating an account. 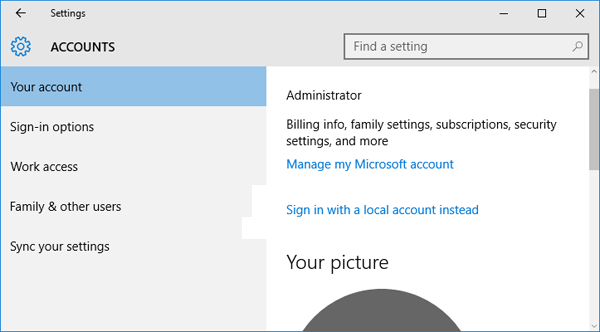 Although it’s not necessary, a Microsoft account can make operating on Windows 10 easier. For example, an account gives you access to Microsoft services and security features like Find my Device and it remembers your account settings, allowing personalized settings to follow you from device to device. Now, turn on your Mesa 2 and say hello to Cortana, Microsoft’s digital voice assistant. Cortana will walk you through the set-up process. Here you’ll connect to Wi-Fi and log in to your Microsoft account. Sometimes Microsoft accounts on the Mesa 2 make it harder to work. Many companies run a single software on the rugged tablet and want to make startup as fast and easy as possible. These companies often bypass the username and password fields with an offline account. It’s not totally obvious how to create an offline account. Here’s how: During the set-up process, when you arrive at the Let’s connect you to a network page, select Skip for now. On the Who’s going to use this PC? page, you’re required to enter something. (You might enter “Work.”) Once you’re prompted to Create a super memorable password, select Next without entering a password. You can now log on to your Mesa 2 without entering a username or password. After this process, however, you should connect your device to Wi-Fi and restart it; otherwise, Windows won’t fully activate. If you already set up your Mesa 2 with a Microsoft account, you can backtrack and use an offline account. Here’s how: Select Start, Settings, Accounts, Your info, and finally select Sign in with a local account instead. If you’re asked to set up a password, and you are not concerned with access security on your Mesa 2, leave the password fields blank. In Windows 10, the Mesa 2 automatically enables Tablet Mode, a tile-based touchscreen-friendly user interface. Some like it. Some don’t. Tablet Mode is unlike desktop mode on Windows 10, and you might be more comfortable using desktop mode. You also might use apps unavailable in the Windows Store or apps that weren’t written for Universal Windows Platform, a programming tool for apps that work throughout the Windows universe like on Windows 10, Windows 10 Mobile, and Xbox One. (Formerly, it was called Metro.) Tablet Mode can exacerbate third-party app compatibility issues because some software apps aren’t optimized for work on a 7-inch touchscreen. 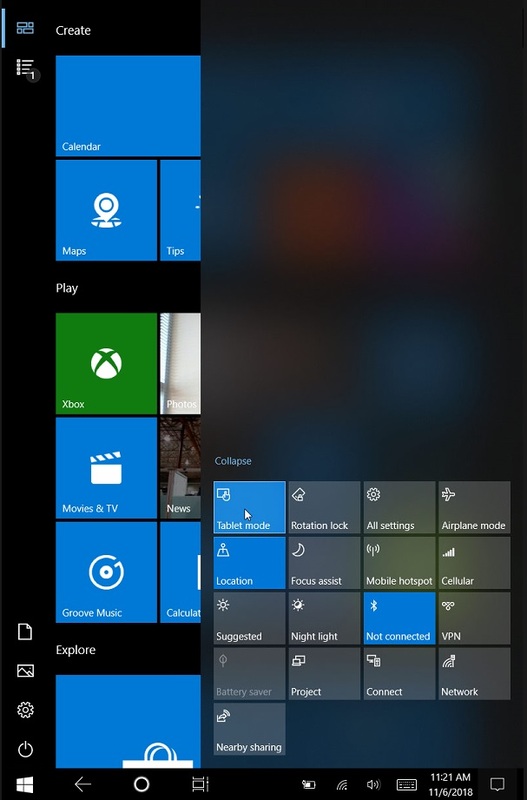 Windows 10 enables Tablet mode by default. In addition, restarting your device will re-enable Tablet Mode. 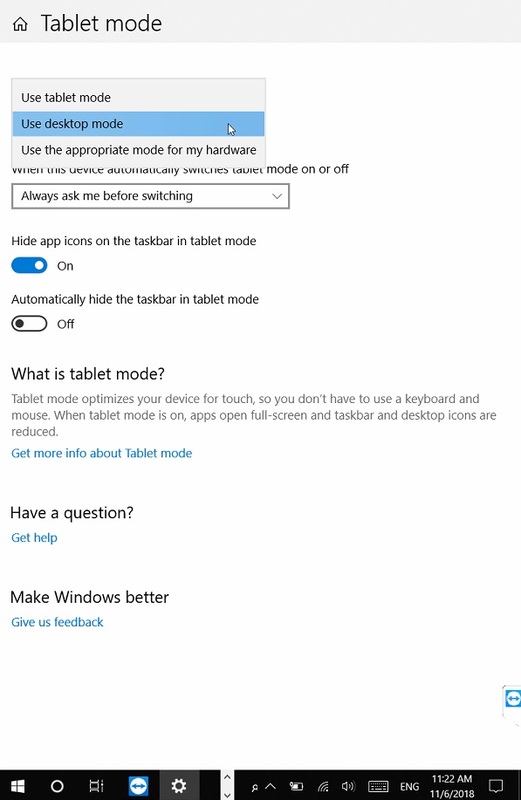 If you want to disable Tablet Mode here’s how: Select Start, Settings, System, and finally Tablet Mode. This menu allows you to change several options. Using the When I sign in drop-down menu, select Use desktop mode. Here’s how to temporarily disable Tablet Mode: Swipe from the right edge of the display, tapping Expand if needed, and then select Tablet Mode to change it from blue to gray. Are some apps difficult to use on the Mesa 2? The Windows 10 taskbar comes preloaded with several pinned items. You might want to remove some of them – and add the touch keyboard button. The left side of the taskbar, which pins applications, comes preloaded with the Microsoft Edge browser, File Explorer, and the Microsoft Store. Here’s how to remove them: Select an application with two-second hold – a pop-up menu should appear. Now, select Unpin from taskbar to remove the application. The right side of the taskbar, which pins system functions or settings, comes with the People icon, a function that allows you to pin contacts. 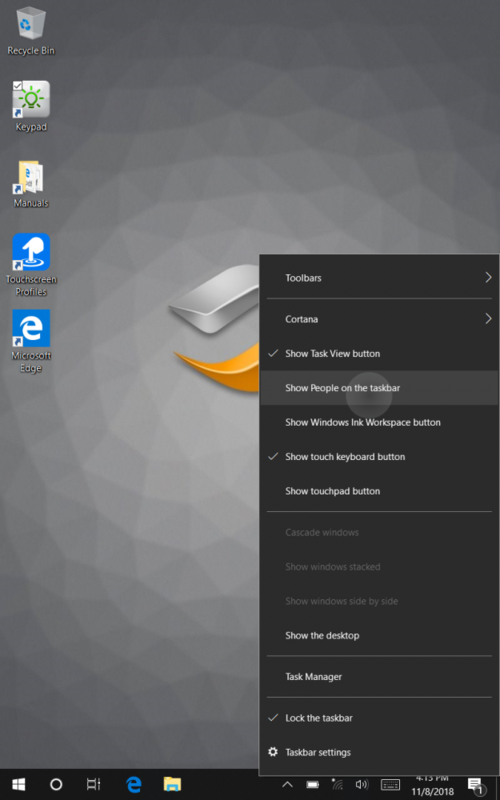 Here’s how to remove the People function from the taskbar and add the touch keyboard button: Select the time and date with a two-second hold – a popup menu should appear. Now, select Show People on the taskbar to remove it and select Show touch keyboard button to add it to the taskbar. You can also access other Taskbar settings from this menu. Windows 10 frequently updates. Sometimes the updates are critical security fixes that protect your device. Other times, it’s an update for a feature. Automatic updates are the default setting on Windows 10. However, Microsoft Windows 10 updates can slow the booting process with updates – sometimes without indicating an update is occurring. An unresponsive black, blank, or blue screen during the startup process might be an update. You can control how and when the Mesa 2 updates – and you might want to control it. Windows 10 updates ensure you always have the latest fixes, security patches, and features from Microsoft. 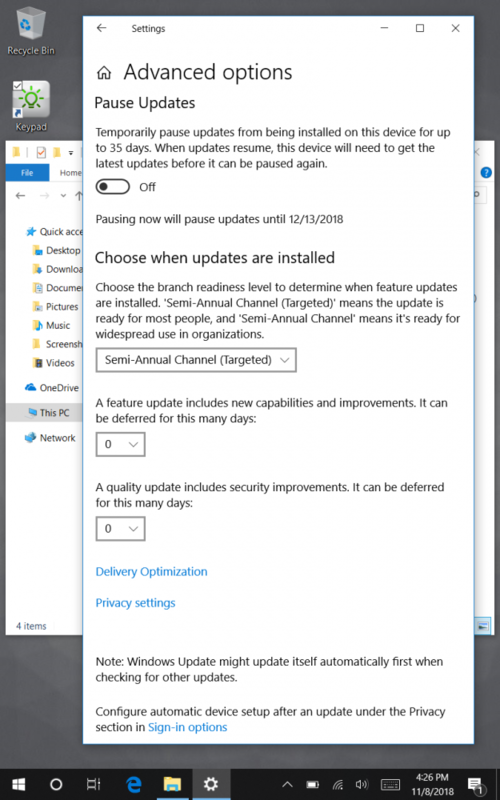 If you want to disable automatic updates, here’s how: Select Start, Settings, Update & Security, Windows Update, and finally Advanced options where you can disable automatic updates. Juniper Systems recommends you charge and restart the Mesa 2 each night, giving the tablet time to install updates. If you want a more hands-off approach to updates, you can select Active Hours, which indicate timeframes for installing Windows 10 updates. 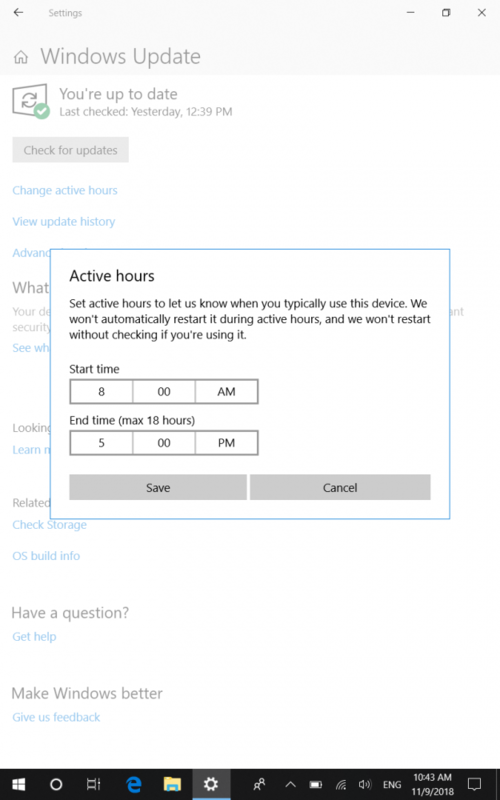 Here’s how: Select Start, Settings, Update & Security, Windows Update, and finally select Change Active Hours. In this menu, select a range of hours when you actively use the device. During these hours, Windows won’t automatically restart the device nor will it restart the Mesa 2 without asking if you’re using it. 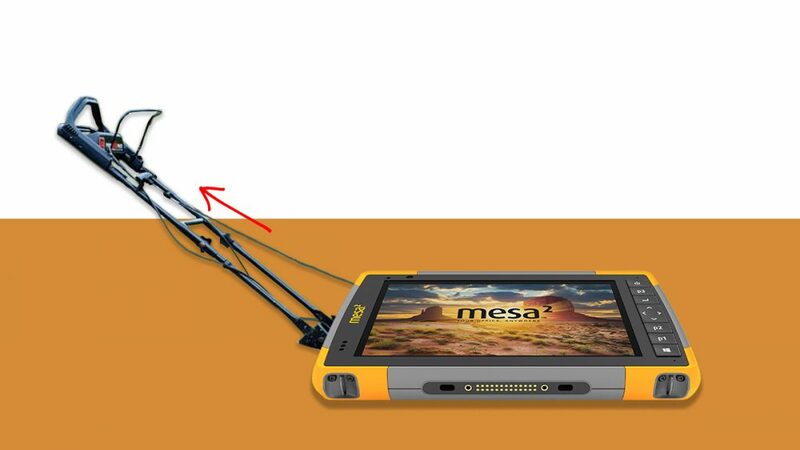 Leave a comment or question about the Mesa 2 Rugged Tablet below. If you want to learn more about the Mesa 2 or Juniper Systems’ rugged lineup of tablets, handheld computers, and GNSS receivers, contact us here. Visit Juniper Systems online here. O'Ryan Smith is the product support manager at Juniper Systems. He joined the company in 2001. I have installed this version of the Windows in my device. But waiting yet to use it. Hope it will make a good response among the users with the features it has been developed with.